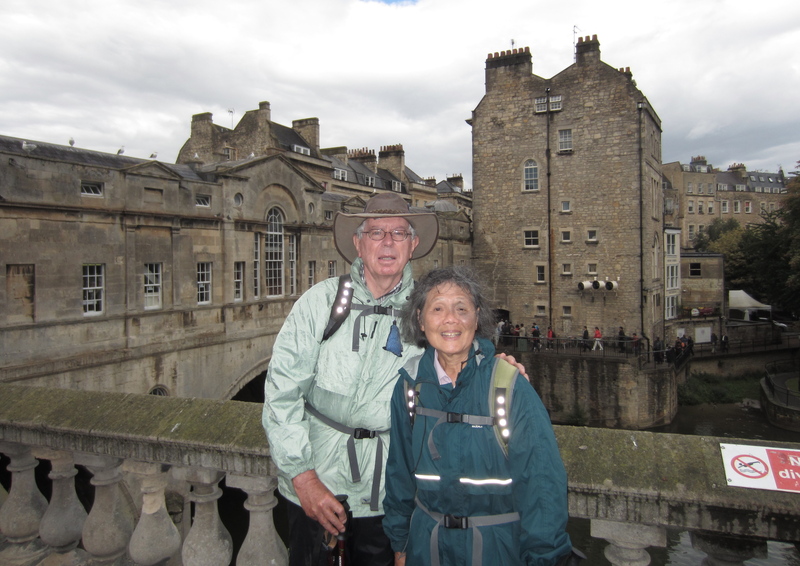 Between heavy showers of rain Emmy and I pose in front of Pulteney Bridge in Bath having walked 175 km south from Chipping Campden over nine days, including one rest day in Painswick. In all, we managed to hit our target of 500 km (we may even have exceeded it a little) over the six weeks we spent walking the Camino, the Cumbria Way and the Cotswold Way. I apologise to readers of this blog for the sporadic character of my posts. Partly this has been due to the very slow and unreliable – sometimes non-existent – internet connections in the remote locations where we stayed in rural England, but mostly it has been because at the end of a long day of walking I have been too stuffed to do anything other than keel over and sleep. But over the next two weeks I will try to “back fill” with two or three reports on the Cotswold Way, plus one or two additional thoughts on our two previous walks and on the walking experience in general. Stay tuned. Congratulations! not only on having put in the planned number of kilometers, but also on not having ditched the blog, great though the temptation must have been. It really does require a streak of heroism to sit down and churn out a well-written and lively account of whatever after a long and tiring day. Looking forward to the flashbacks!